We've just hit the 10,000 page views mark this morning so a big thank you to all our readers. When we started in April, 10,000 seemed unreachable especially after the first month's meagre tally of 111. But with films of the calibre of Bare Behind Bars and The Adventures of Buckaroo Banzai Across the 8th Dimension we have managed to climb up to these five digit giddy heights. If you have any comments about what you like/don't like or what you'd like to see us do (please don't suggest that we review any really bad films; I feel traumatized enough already after the aforementioned delights) feel free to comment here, contact us on Facebook or Twitter or email us (find contact details in the About Us section). To celebrate, have a lovely new background. We just keep on giving. A Bavarian village is in big trouble because the foreman who knew how to make the renowned ruby glass has died, taking the secret with him. 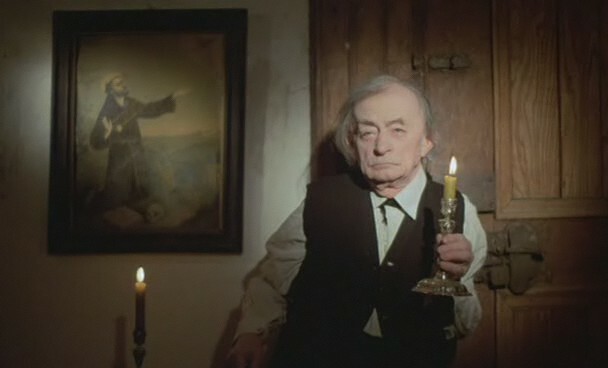 The master of the village, understandably, starts to go insane and turns into a pyromaniac and a murderer. A seer from the hills making predictions, in the style of Nostradamus, is thrown into the mix. Then everything goes a bit pear-shaped. Here is a typical scene: a man dances with a dead villager, accompanied by a fellow with a hurdy gurdy. In the foreground sits a man cackling away, encouraging the surreal dance, while a woman holding a duck stares gormlessly into space. Welcome to Heart Of Glass. Most of the actors were hypnotised for their scenes. 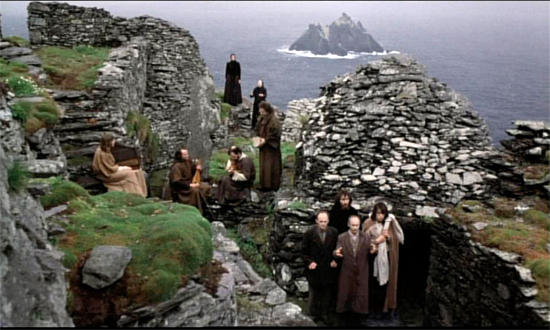 You can't accuse Herzog of playing it safe and it does create a strange dream-like atmosphere. The only people who weren't in a trance were the glass blowers going about their work. 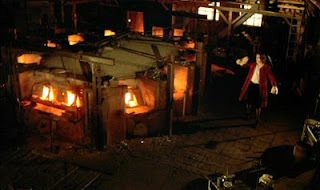 Glass blowing with stunningly hot molten glass and hypnotism do not make good bedfellows. Obviously, they were allowed to drink plenty of beer to keep them cool. Also the seer Hias (Josef Bierbichler) was unhypnotised. He just acts like he is, staring into the far distance as if he's seeing the future. He is a strong presence and you look forward to his scenes. There are some gorgeous landscape shots within Heart of Glass, the initial scene with Hias and some cows in the mist is a highlight. Herzog lingers on these shots long enough for you to appreciate them. The commentary is very entertaining. 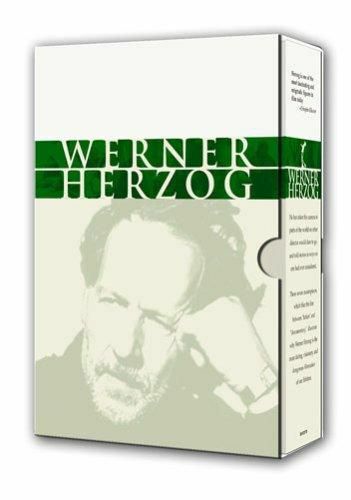 You learn about Herzog's childhood in Bavaria and there are quite a few amusing anecdotes about the making of the film. Herzog actually did the hypnotising himself. Brave cast. 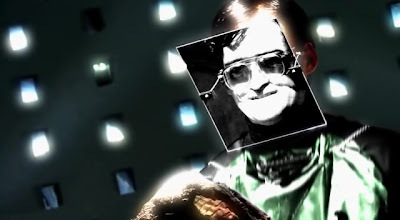 He endears himself to me though, by not having a clue why he did certain things, the end sequence for instance, where he tells a completely separate story. He just admits that he can't explain it. Top bloke. I've actually managed to make it sound more exciting than it is. Slow pacing and some inscrutable dialogue make for quite an endurance test. The pacing is not a problem in itself - I like Jean Rollin films, where the slowness is part of the charm - but the main issue is that not much happens. 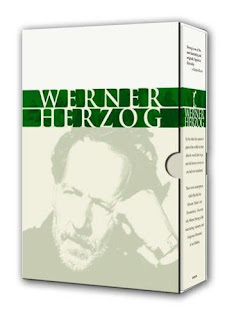 I think that Herzog films, much like Rollin's, are an acquired taste. Worryingly, they are starting to grow on me. Even Dwarfs Started Small, Fata Morgana, The Enigma of Kaspar Hauser, Eraserhead, Mulholland Drive, Inland Empire. There's a certain DIY quality to Jamin Winan's urban fantasy that is both engaging and irritating in equal measure. After watching the extras it becomes apparent that Winan was unable to secure funding from any major studios and had to scrape finance together from other sources to make his film. To his credit he didn't hold back on the scope or ambition of his project and Ink is an interesting mix of styles, effects and storytelling. Having said that this is a long way from an Oscar nomination. The best bits all centre around the evil guys. 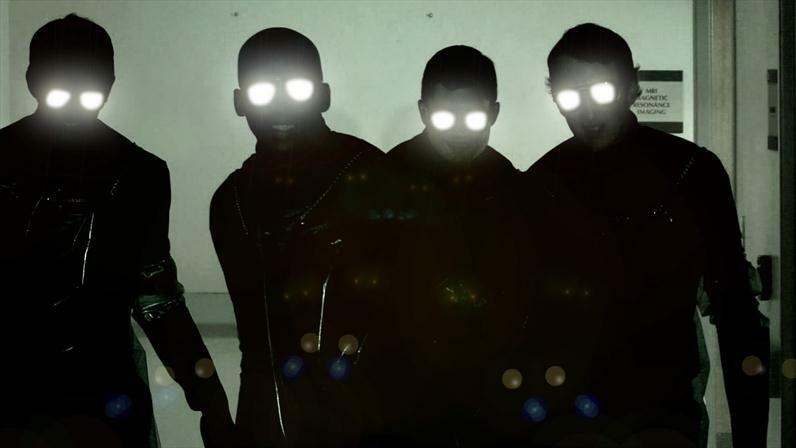 Their visual representation is really creepy, original and different, with their monitor style faces showing the most evil, smug grins as they slink around, snickering in suitably menacing fashion. The fight scenes are also reasonably effective in a Vauxhall Conference version of Crouching Tiger, Hidden Dragon kind of way. The special effects overall are average, but considering the budget they hold their own against bigger blockbusters than this, and wouldn't look out of place in Torchwood. I'm not sure if that is praise or criticism. The whole look and feel of the film is like a children's drama series from the last century, something like a cross between The Tomorrow People and The Sarah Jane Adventures which is at times a little distracting. Worse is to come however: the acting throughout is at best amateurish and at worst like Children's BBC presenters in the end of year panto. The costumes and make-up don't help matters either as both display the trademark 'homemade' quality that run throughout the film, and you get the feeling that a trip to the Party Warehouse and Primark with £50 could have kitted out the whole cast much more effectively. Maybe these criticisms are a little harsh but the combination of issues make it impossible to concentrate on the story. A story which is arguably one of the film's strong points. Pound for pound it's probably one of the best films ever made but unfortunately it doesn't quite cut it in the Premier League of film. Worth a watch though, and if your expectations are not too high it's relatively enjoyable. We come to the final instalment of our Buddy Movie Season. Drive is a hidden little gem amongst the pile of 'dog presents' that is the straight-to-DVD action film (generally speaking, of course). This is very similar to Rush Hour, but I think it was made well before it. The copyright on the back of the DVD is dated 1995. It probably languished for a while in someone's car boot before getting a release date. There is a rubbish version that was butchered at the producer's request. You want the 112 minute version with the proper soundtrack. Way better. 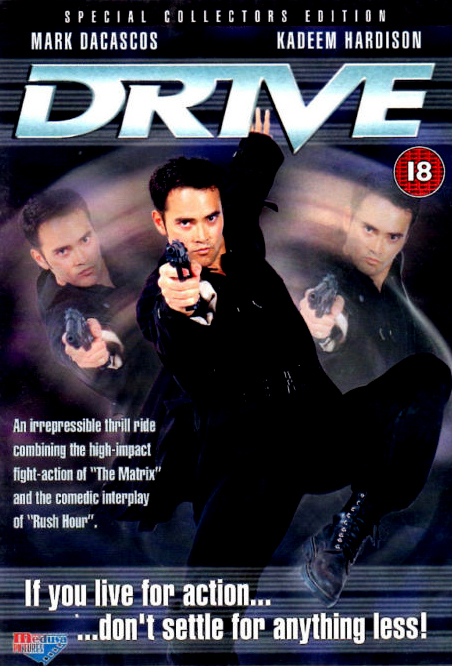 Starring the legend, Mark Dacascos (Brotherhood of the Wolf) and comedian Kadeem Hardison, you can see where the Rush Hour template came from. Toby Wong (Dacascos) has a Bio-Engine inside him, that makes him a top bloke for having next to you in a scrap. A Chinese corporation wants it back. Malik Brody (Hardison), reluctantly at first, helps him to keep it out of their greedy little mits. It has a low budget, but there is so much action on-screen that you don't tend to notice it. The fights are well choreographed by Koichi Sakamoto and he shows a total disregard for the safety of his Alpha Stunts team, in a similar fashion to the early Jackie Chan films. People get thrown into heavy metal machinery, nearly break their backs on huge pipes, barrels and shelves, and someone falls off a motorbike. By being flying kicked in the face. Every fight includes a different element to keep it fresh, for example, our stars being handcuffed together or the use of tasers and whips. Yes, whips. It does become surprisingly dark by the end of the film, for a comedy. All good clean fun, though. 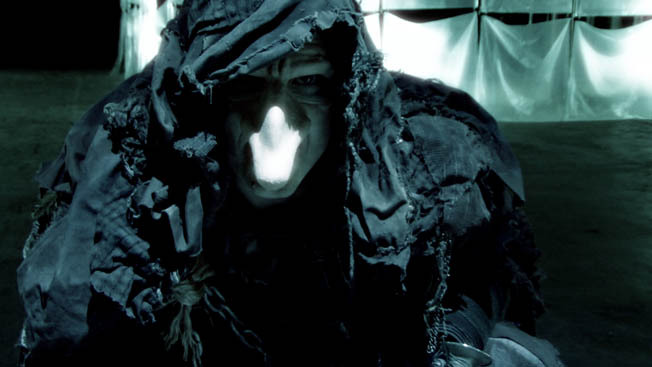 A mention here for the late Brittany Murphy (Sin City), who is fantastic in this film. She taunts and flirts with Malik through all of their scenes and it is a shame when she is left behind at a roadside cafe and plays no further part in the film. Most of the humour in Drive doesn't actually come from the film. Stick with me on this one. For once, it is a good idea to listen to the commentary track. Easily the best one I've heard. I listen to the commentary as often as I watch the film. Steve Wang, Koichi Sakamoto and the two stars discuss the film and point out loads of funny moments that you would otherwise miss. I won't spoil any of them for you. Oh, and Koichi keeps trumping and laughing about it in a comedy high-pitched fashion. This is an action classic, if you give it a chance. It's a shame that Steve Wang hasn't been given the chance to direct more. Obviously, the way he talks about the producer, on the commentary track, doesn't help his cause. Rush Hour, Police Story 1-3, Mutronics, Guyver - Dark Hero, Crying Freeman. I'm going to avoid the obvious opening sentence for this review. Many won't. 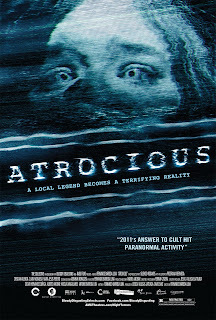 If you call your film Atrocious it's got to be stunning or you're asking for trouble. It's not stunning. It's not even passable. How do films like this even get released? Found footage films are starting to get really tiring. You can only watch so much of someone running round a forest, filmed in amateur-o-vision, before you lapse into a coma. But wait, there's an exciting twist in Atrocious, the forest is filled with spiky bamboo and it's a maze. In reality, you still end up watching endless, interminable shots of someone running round a forest. The maze is in no way visually interesting. It looks like an overgrown maze in an unloved, run down park. But our crafty filmmaker has got other tricks up his sleeve. Cristian, the brother in the family, tells his sister July to look at a creepy gate. Er, it's a gate. Not creepy. Later on he finds a vague path through the bamboo. He continually describes it as 'cool'. Really, it's another virtually indistinguishable path through the forest. Not cool. Show me something creepy or cool, don't just tell me that it is. Christian and July are investigating an uninspiring urban legend of a lost girl who shows you the way when you become lost in the woods. They are filming their investigation. Why is it that in this type of film, where the characters are supposed filmmakers, they have no cinematic ambition? The closest we get to style is a locked off shot for an interview with a friend of the family. Everything else is handheld and worse than your average family's holiday footage of Skegvegas. I could understand it if the style changes from traditional filmmaking to shaky-cam when the action kicks off - this could be quite effective - but rather than adding to the reality of the film, the lack of style pulled me out of the film. I know that they do this to keep costs (very) low, but how much does it cost to have a well composed establishing shot of the house? There are some positives. There was one moment when I jumped. Shame it was one of those funny jumpy things that you get when you're just about to fall asleep, nothing to do with the film. Somehow, there were moments when I had a shiver down my spine. There was no payoff though, no creepy image or proper scare. The director has the sense - but only after about ten minutes of forest running - to take the action back into the house. Potentials for scares abound in this section. There aren't any. Not even one. When the best thing about a film is a dog called Robin - and he's not in it for long - you know things are not good. Please, let this be an end to poorly made found footage films. If you want to see it done well, watch Lake Mungo. Lake Mungo, Rec, The Silent House, Paranormal Activity. If you've watched any of the Naruto TV series, then chances are that you've already seen this. If not, a bit of back story is in order. Naruto is a trainee ninja who has the Nine-Tailed Demon Fox sealed inside him. He doesn't have that many ninja powers apart from the use of the Shadow Clone Technique, which consists of loads of Naruto copies appearing and generally hitting people. 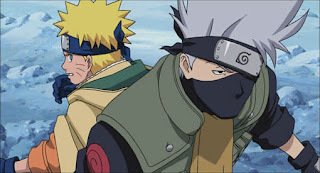 Sakura and Sasuke are his ninja chums and Kakashi is their immensely cool sensei. 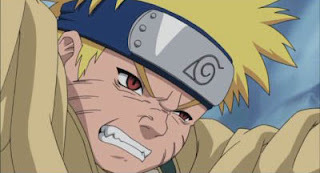 Naruto's main characteristic is that he's a bit of a useless ninja but he never gives up. Ever. He can get beaten to a pulp, on the verge of death, and he still gets back up and carries on fighting. You can't help liking the little fellow. The TV series is great, but seriously slow. A battle starts between two ninjas, five episodes later it's still going on. In the first series, our ninja friends have a mission in a misty location and it lasts for hours. You can't just fight someone in Naruto, you have to chat about how you're going to fight them and partake in some serious posturing. 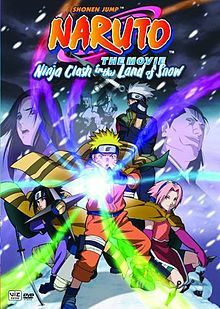 This first Naruto film dispenses with the slow pace and moves along at a fair whack. There are still some flashbacks, but it is refreshing to watch a Naruto product where things actually happen vaguely quickly. You can tell that this has a bigger budget than the TV series. The set-pieces are all entertaining, making use of CG where appropriate. The climactic end battle is good fun; even Sakura gets in on the action for once. Most of the film is appropriate for younger children so it is strange that one of the scenes, recalling the end of Hero, is overly harsh. Tonally, it is very different from the rest of the film. You will get more out of this if you watch the series first, but that is an acquired taste. Watched as a standalone film, there is still plenty of enjoyment to be had. Naruto (the TV series), Bleach (the TV series), Summer Wars. "PRETTY DAMN SPECTACULAR" exclaims the poster. Reading that, you know it's a bit of an exaggeration. That's only natural for marketing purposes. So, let's tone it down to make it slightly more accurate: "tedious". That's better. It's not very often that I want to walk out of a film, but I was so bored by this that is was a real test of willpower to stay to watch the end. 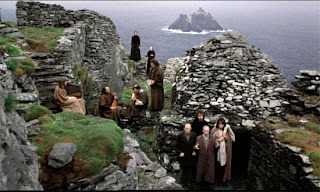 I was rewarded by some great images in the final scenes that reminded me why I'd gone to see it in the first place. The sight of a little fellow facing off against a huge two hundred foot tall troll will stick in my mind and hints at what could have been a far better film. 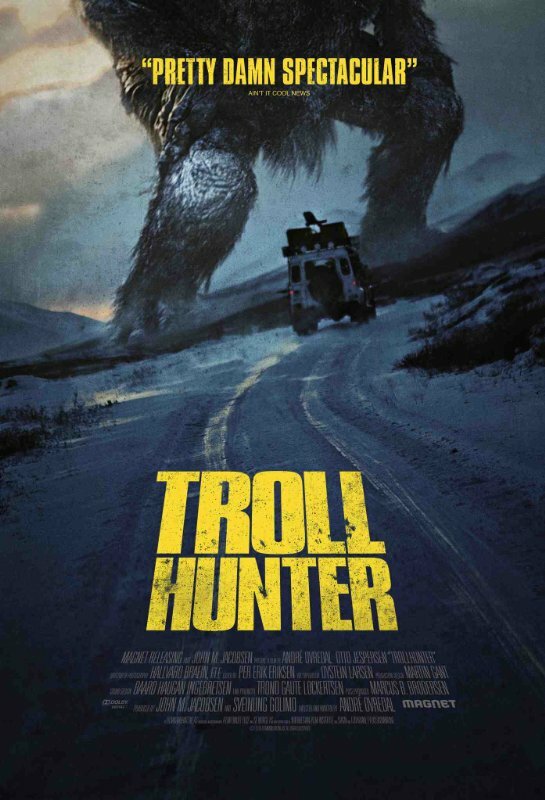 Troll Hunter belongs to the family of found footage films such as The Blair Witch Project. Three students are investigating a local poacher, who they suspect is not just hunting bears. They track him down and eventually end up documenting his exploits, which unsurprisingly involve trolls. There is gentle humour running throughout, and by 'gentle' I mean that the corners of my mouth moved up marginally on a few occasions. The laughter highlight is seeing three goats standing on a bridge as bait for a troll that lurks beneath. Hilarious. The trolls are definitely the stars due to the severe blandness of the human characters, including the titular troll hunter. 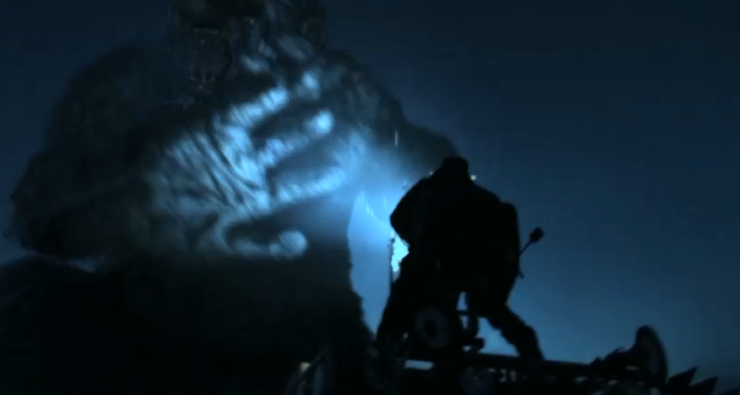 They are obviously CGI creations but the fresh creature designs are a sight for sore eyes. Along with shots of winding roads, shot handheld though the car window, they lend the film a modicum of atmosphere similar to the excellent PS2 game Shadow of the Colossus. Diverse in shape, size and sometimes in the number of heads, they are the only reason to stick with the film. It's hard to put my finger on why it was so dull. 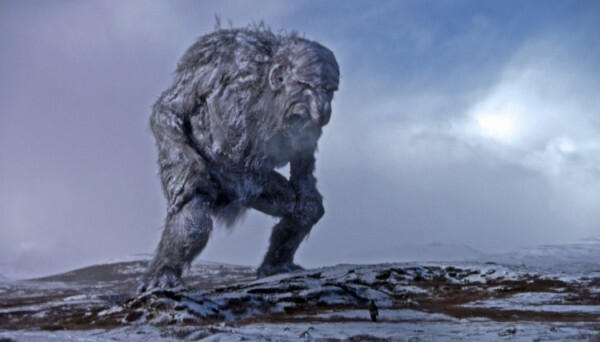 Things do happen: trolls explode, turn to stone and generally stomp around. But there's no tension or excitement. Maybe again this is due to not caring about the characters. One of the students gets rabies and you just want him to die quickly so that you can get back to looking at trolls. Also, in the middle there is a mention of mountain trolls fighting forest trolls. Don't get your hopes up, because it never happens. Really disappointing then. I wouldn't even recommend seeing it on DVD unless it was in a half price sale in Poundland. And you'd already watched the 10 Sci-Fi Movies pack that you bought from there the week before. 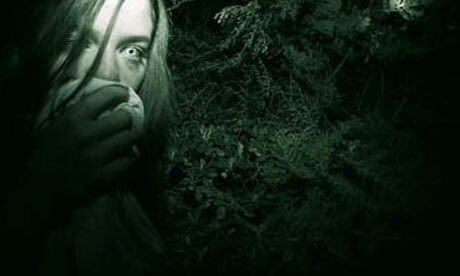 The Blair Witch Project, The Dark Crystal, The Silent House, Rec. The Warlords is an historical epic set in China in the 1860s. 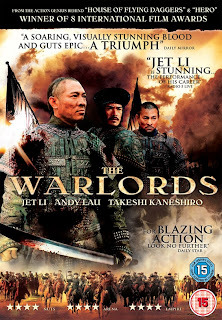 It revolves around three blood brothers played by two mighty oaks of Asian cinema and an up and coming sapling. Jet Li (Hero) plays General Pang who has just returned from a battle where all of his men were massacred. 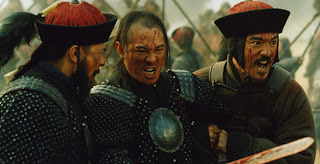 He comes across a merry little band of bandits led by Zhao Er-Hu (Andy Lau - Saviour of the Soul) and Wuyang (Takeshi Kaneshiro - House of Flying Daggers). They become top mates and decide to join the army. For a tale based on a real life occurence, they have taken some liberties with the battle scenes. At one point, Pang scythes his way through the legs of about four enemies with one swipe of his trusty blade. In reality, it would get stuck in the bone of the first bloke. Never mind. It looks cool. 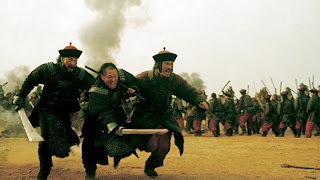 Some of the earlier scraps are played more for their action value, so it is a surprise when midway through the film Pang orders the execution of an entire enemy army. This is very effective due to the director showing the reactions of the soldiers committing the atrocity rather than the atrocity itself. The anguish on their faces is palpable. The acting throughout is well done, especially from our three leads. Jinglei Xu also performs admirably as Lian, one part of a love triangle. 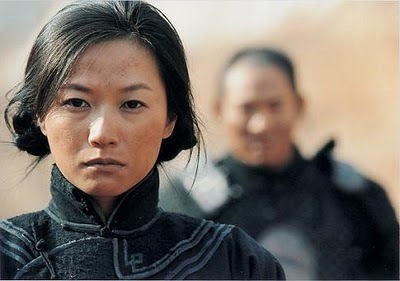 The film looks beautiful and suitably epic at times: from the virtually monochromatic palette of the battles to the rich colours of the temples in Beijing. The only thing that lets it down is the use of some jerky slow-motion that looks like it was added at the editing stage, rather than being filmed with a high-speed camera. All in all though, I enjoyed this. It has a similar theme to Hero in that if you commit evil but it leads to a period of lasting peace can you be considered a monster? Mmm, ponder on that. Hero, House of Flying Daggers, An Empress and the Warriors, Red Cliff. I am getting quite obscure with this one and sadly, you can only get it on VHS. It deserves a DVD release because it is pretty entertaining despite a small budget. 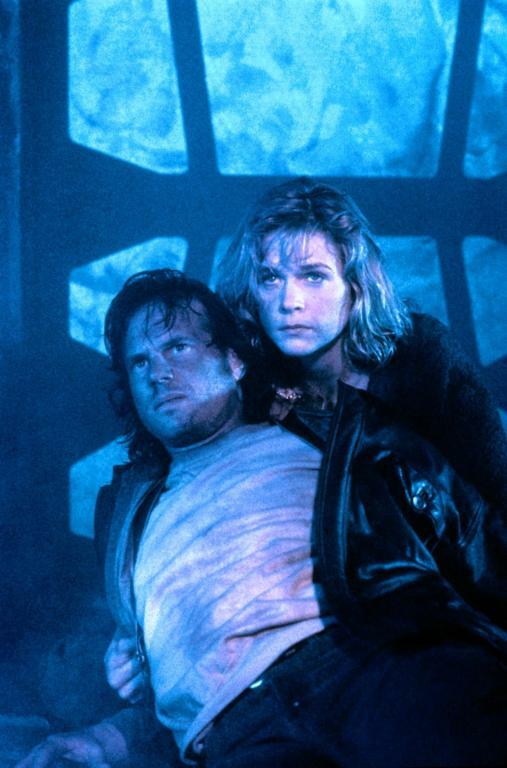 Tucker (The legendary Bill Paxton - Aliens, Weird Science) and Flynn (Lindsay Frost - The Ring, Dead Heat) are two mismatched cops (obviously) who stumble upon an intriguing case. They witness a woman trying to mow down a little lad in her car. She then gets out and shoots him to death. A fairly shocking start for a direct-to-video sci-fi actioner. The relationship of the main two characters strikes the right tone from dislike at the start, through grudging respect, all the way to top buddies by the end. Unpredictably, it doesn't stray into romantic territory and the script plays on this in the final scenes. Louis Gossett Jr. is also likeable in this. 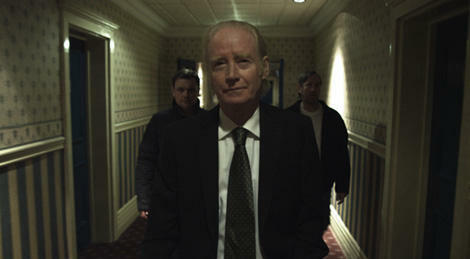 There's a great scene where he tells the high-level officials from the Department of Historical Research, led by John Hurt, to get out of his police station. Cheesy but fun. Why though, does he get the credit of Louis Gossett Jr. as "Mac"? He can join the ranks of other egotastic characters like Holly Marie Combs as "Piper" (Charmed) and Alyson Hannigan as "Willow" (Buffy). John Hurt is a quality actor. Not in this though. He has a shocking, wheezy, strange quality to his voice, like he's recovering from a severe kick in the windpipe. His accent's poor too. Then we get on to his overacting. In the final scenes, he is so giddy, shouting and shaking his hands in the air, that you wonder whether he's completely lost it. Still entertaining though. 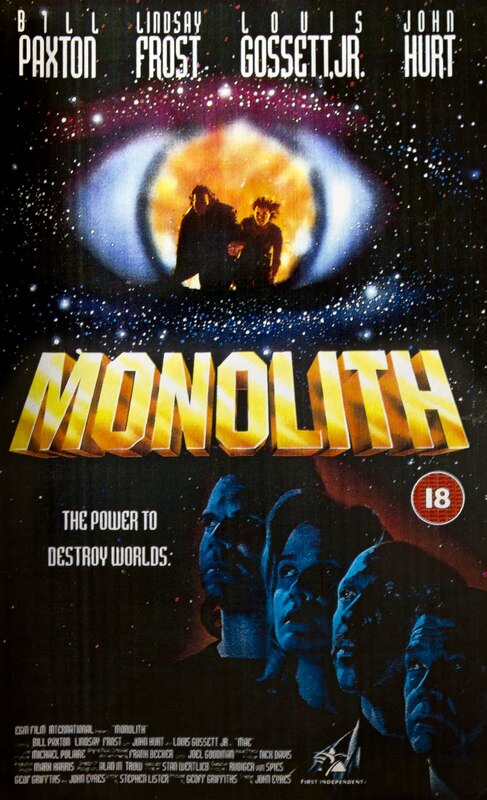 The good thing about Monolith is that you're never bored. The pace is fast throughout the film and there's loads of action for your pennies. You get exploding ambulances, people thrown off buildings, fireballs shooting out of people's eyes, a fight atop a steel girder framed building and, get ready, our heros jumping towards the camera, away from an explosion, three times! Admittedly, one is not that big, but one is out of a spaceship, so that's way more than Tango and Cash had. 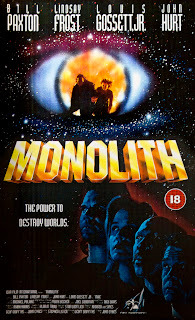 Worth tracking down if you can for a bit of pre-CGI science-fiction. It has a feeling of many similar films of that time: The Hidden, Aliens and Predator 2. If you're lucky, you may see it in a car boot sale for £1. That's where I got my copy from (smug grin and a cocky wobble of the head). Remember that this is VHS not DVD. 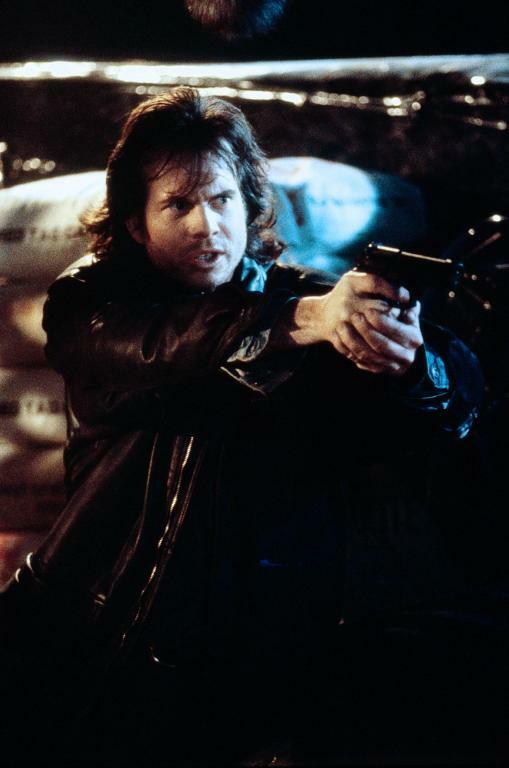 Dark Angel, Split Second, Warlock, Drive, Tango and Cash. 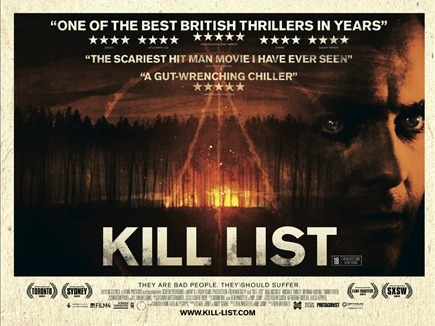 Beware the trailer for Kill List. When I saw it, I wasn't that impressed. In fact, I thought it looked like every other dull gritty cockney film incorporating guns. Suffice to say, I went anyway to have a peek, seeing as though it was filmed in Sheffield. I'm glad I did. It was way better than expected. It was funny, relatively gory and strangely disquieting. 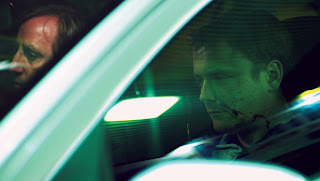 Neil Maskell plays Jay, who is an out of work soldier. Due to this extended period of unemployment, his relationship with his wife is suffering. 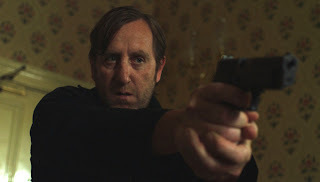 When Gal (a charismatic Michael Smiley) approaches him with the offer of taking on a job involving assassinating naughty people, he decides to give it a whirl. Why wouldn't you? You know from early on that something sinister is afoot. The director's use of familiar locations, both urban and rural, strange character behaviour and ominous bass tones in the score all lend the film a feeling that something really bad is going to happen. Flashy editing techniques that draw attention to the filmmakers are not normally my cup of tea, but the director's use of jump cuts adds to the sense of unease. The whole film gave me the same feeling of dread as several David Lynch films, Mulholland Drive in particular. There is one scene that people will talk about for some time. I won't spoil it, but it involves a DIY type incident. You know that something violent is going to happen and you are waiting for the camera to cut to a special effects shot. It doesn't. Graphic and brutal. Mmm. It would be interesting to watch again to see how it was done. In a similar vein to Antichrist's middles abuse, you're not sure how far they're going to take the violence in the rest of the film. Sadly, nothing gets close to topping this scene. A bit more savageness in a knife attack later on might have done the trick. 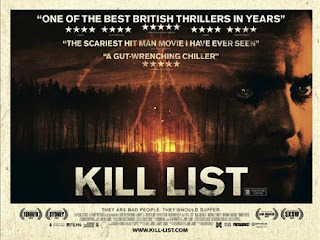 For all that Kill List is unsettling, I didn't find myself feeling scared. 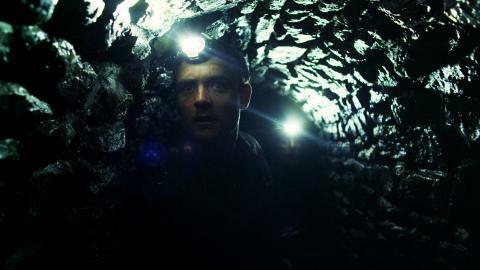 An effective chase sequence through a forest makes you think a change of y-fronts is just around the corner, but the tunnel sequence that follows is basically a corridor shooter (the game Doom is a prime example) in film form. Someone runs at them. They shoot them. And so on. There is no tension, just confusion as to where the next attack will come from. A shame. I feel like I've been a tad picky there, as I really enjoyed it. Properly funny - the guitar scene is a highlight - and at times disturbing. 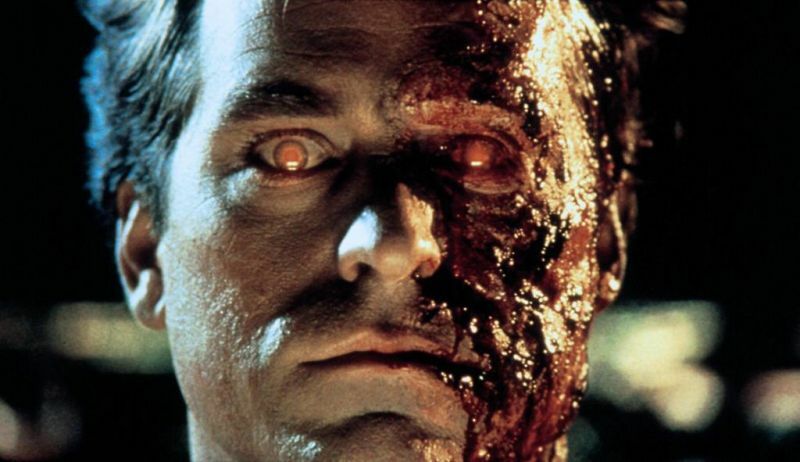 Comparisons to other films will be made, in particular two films that played as a double bill when released, and it deserves to be in such fine company. One of the best British films I've seen in ages. Just ignore the trailer. It doesn't spoil any of the film's delights and hopefully I haven't. Antichrist, Mulholland Drive, Wild at Heart, The Wicker Man, Don't Look Now.